So to start, yes, this is a re-release of a 2014 Wii U game – one of the best looking Wii U games, but the same nonetheless. Luckily, that Wii U game just happens to be fantastic, and there are a few new additions to freshen things up too. The change you’ll probably run into first is the third-tier of drift boost. Previously, drifting around the corner would send sparks flying from your rear wheels in red and blue, but now a third pink tier has been added, rewarding you for really swinging out your rear end and hitting those corners sideways. The fact that this minor variation counts as a change should tip you off to just how similar Mario Kart 8 Deluxe is to its not-Deluxe predecessor. 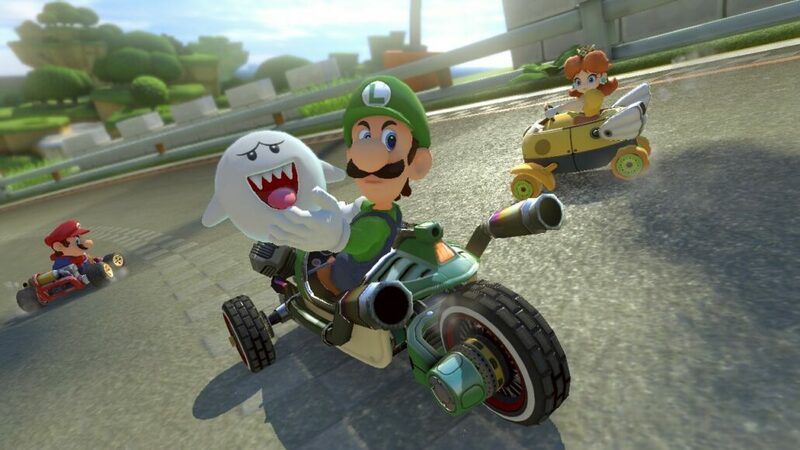 But you can’t complain when Mario Kart 8 is arguably one of the very best games in the series – hell, it might even be one of the best kart racing games out there, period. Just like on Wii U, Mario Kart 8 Deluxe offers tight controls, a great variety of karts and swappable parts, loads of characters and some of the very best track design in the series. 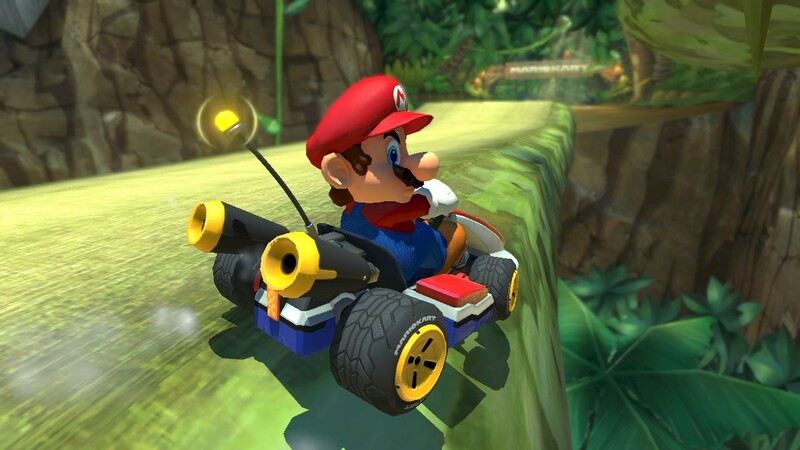 Now that a few years have passed by, Mario Kart 8’s gravity-bending gimmick isn’t exactly the most amazing feature – though even without it, these really are some of the best tracks in any colorful kart racer, that goes for both the all-new tracks and the inspired recreations. 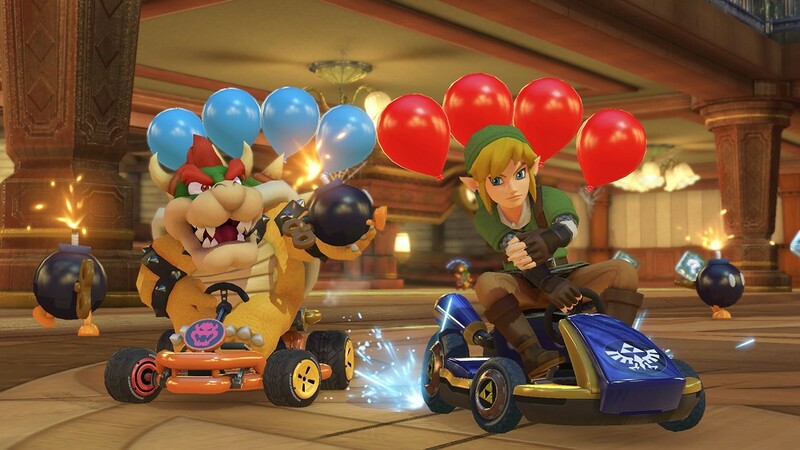 But there are no truly new tracks in Mario Kart 8 Deluxe, instead we get an all-new Battle Mode and a few new Battle Mode courses to race around on – and, lo and behold, Nintendo have fixed Battle Mode. 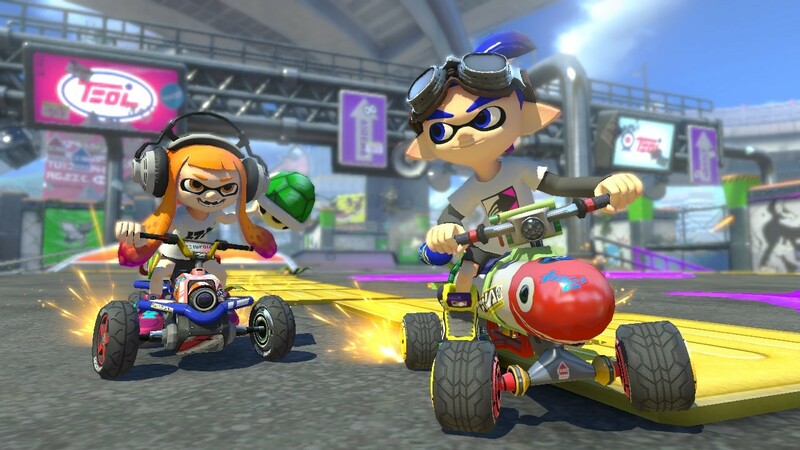 Mario Kart 8’s Battle Mode was rightfully despised for having no unique arenas, instead taking place on the race tracks themselves, destroying the flow of a traditional multiplayer Mario Kart experience. Mario Kart 8 Deluxe rectifies the mistakes of the past and even includes an arena inspired by a Splatoon stage, just for good measure. And the new Battle Mode is great – thank goodness – with a range of game types to boot. Renegade Roundup might not be the best of the bunch, with games often ending swiftly, leaving a sour taste in the mouth – but the likes of Shine Thief and Bob-omb Blast are wonderfully fun and complement the classic Balloon Battle mode nicely. It’s also with glee I announce that playing Battle Mode online is, actually, great. In my experience with the online, Battle Mode worked smoothly and I saw none of the players lagging out, jumping around the track, as I was initially afraid may happen. Playing in Docked mode using a wired ethernet connection, the online service was flawless for me. But ultimately, this is a game which I struggle to justify a purchase for. After all, this is a game which I’ve played through the vast majority of content for already, multiple times over on the Wii U. This glorified Game of the Year edition essentially bundles DLC, adds some Battle Mode improvements, and then what? Well, actually, it holds up better in 2017 than it did in 2014. Don’t get me wrong, the resolution bump and minor extras are nice, but what is there that’ll bring back Mario Kart 8 fans that bought all the DLC before? Well, the Battle Mode is a nice draw, but the real meat is the form factor. Ultimately, Mario Kart 8 Deluxe holds up better as a handheld game in 2017 than it did as a console game in 2014, and even then it was a standout title when it launched. Graphics are crisp, especially so on the Switch’s screen, and the music is just as bombastic and catchy as it was a few years ago. Make no mistake, playing Mario Kart 8 Deluxe as a handheld game is a transformative experience. I’ve played hours upon hours of Mario Kart 8 with friends, locally and long distance, so when Mario Kart 8 Deluxe was announced, I was actually feeling, well, a little dejected. Why play the same game all over again? As it turns out, while I’m not willing to change my Wii U disc, change my TV inputs, ensure my gamepad is charged, I’m totally willing to just pick up the Switch from its dock and start a race. I’m always ready to throw down and start racing against a pal when I detach the JoyCon, too, anytime, anywhere. While Mario Kart 8 Deluxe isn’t revolutionary – in fact, it’s more of the same – it can’t be understated that what is here is actually a fantastic package. Admittedly, if you’ve played Mario Kart 8 and its DLC before, then there isn’t much here to draw you in, but this is one of the very best kart racers ever made, with one of the best selection of courses ever, and one of the best soundtracks. On top of all that, you can now play it on the train or bus without a single wire to tie you down. Stellar. Review copy provided by the publisher. You can buy a physical or digital copy of the game via Amazon. Ultimately, this might just be the best version of the very best Kart racer there is. If you're a Mario Kart 8 veteran then I'm not sure how much here will draw you in, but new players and multiplayer fanatics will find dozens of hours of fun.